SIGN UP TO RECEIVE YOUR MONTHLY COLLECTOR KNIFE. The Knife Collector Box is designed with every knife collector in mind. Each month we deliver some of the finest knives from around the world straight to your door. 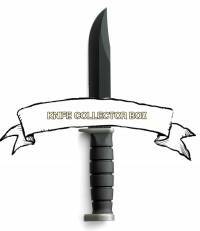 Rest assured, you will always receive the very best value with the Knife Collector Box. Choose one of our 4 boxes. Receive your package and start using your knife.